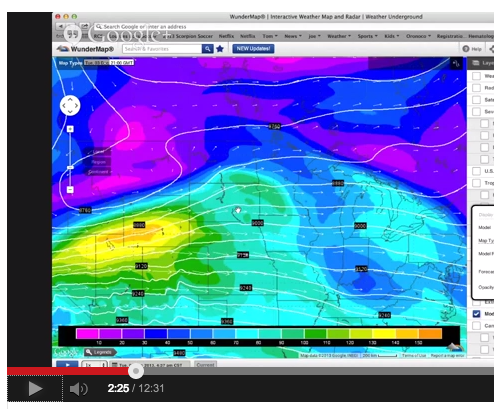 Finally, if you’d like to learn more about the atmospheric dynamics causing the upcoming storm scenario, view our video with forecaster Tom Novak. Let the fun(snow) begin!.....I love it when there is a large disparity in snow totals, something to follow instead of most everyone going with a broadbrush 1-3 or 2-4 totals.....it separates the men from the boys or the professionals from the armchair ones.....in any case I just want to see a decent snowfall to liven our landscape and get rid of all the brown around and start a foundation for some winter recreation to begin.....be safe out there because when the temps drop everything will freeze solid and icy roads will become an issue if MNDOT isnt all over this regardless of how many inches falls in your area. My dancing and prancing must have caused the storm to shift south over the past couple of days! This will be fun to see how it pans out. I just hope we don't waste this amount of moisture in the form of a sloppy mess, especially with the cold that will follow. My dancing will continue throughout the night. Bring it!!!! Would not be surprised if they shift the Winter Storm Warning south.. the NWS now has forecasts of 4-8 inches as far south as Lakeville- New Prague- It makes me wonder why they have not already. So what are we looking at for timing? Initially mets seemed to think the snow would arrive this evening, but it seems to be having a hard time migrating out of South Dakota. I still do not buy into all the hype. Looking at radar trends, the storm is farther north and west than where the models project. MSP will be lucky to see 2 inches at best. Do not be surprised if tomorrow morning commute is actually perfectly fine with just wet roads and possibly a mix. Thank you to Dr. Novak for his explanation. Always find his stuff interesting. Due to the cold weather behind this, I hope the metro misses most of the snow. MNDOT will have there work cut out to avoid washboard roadways if we get what the NWS is predicting. I know most of you are dead to the world right now.......but I'm here to tell you the snow has started falling in ernest about 2:30am here in Eden Prairie.....better late then never! A whopping half inch of snow in Apple Valley. The snow has ended here. Now it's RAINING!! Extremely Disappointed! It looks like Dr. Novak was right. Meanwhile Duluth will get absolutely buried today...again! It's raining here in Eagan too. WTH??!! I knew that we were going to get short changed with the snow and only pick up maybe an inch or two, despite the official forecast, but nobody predicted rain!! To add insult to injury, as the dark green radar echoes move over us, it just keeps raining. Our little dusting of snow from this morning will surely get washed away if this continues. Sorry Eagan and Apple Valley....please keep the rain down there....heavy snow falling here in Golden Valley with 2.5 inches on the ground. It just started snowing steadily in Rosemount. It was raining/sleeting earlier. We have about an inch of snow. I got up this morning thinking I'd need to drag out the snowblower. But we only had about an inch in Roseville at 8am. I could still see the edge of the grass where it meets the driveway. Not sure why those of you in the south metro are so surprised that only a little bit fell overnight and it is rain/mixed precip right now. It was forecasted. Pretty sure a lot of mets called for a "mixed bag" in the south metro this morning with a changeover to snow about now (like it just did). It was well advertised that the rain/snow line would probably hover right around Dakota county, and it has. Maybe it's people not really paying attention, hearing what they want to hear, or bad explanation from mets, but what has happened in the south metro so far is exactly what was predicted, no clue why people are shocked. "hearing what they want to hear"
The forecast last night called for all snow last night (1-2 inches) and 100% chance of snow today (2-5 inches) in the south metro. The only exception was for the far southeast metro where it could be a mix. It didn't rain too much in the south metro. It snowed a little bit overnight/early this morning. It turned to a mix and has turned back to snow in the past 45 minutes. Forget about it, south metro folks. You're getting hosed. This is not your storm. I just arrived in Apple Valley. It's sleeting here. It was snow all the way from Minneapolis on my way down here. Checking in from down south. This is definitely not where you want to be if you want snow. I just drove through Rosemount, Apple Valley and Burnsville; nothing but sleet. It has switched back and forth between brief periods of snow, mostly sleet and some rain today. There is about an inch or so of snow/sleet on the ground. Highway 13 and Cliff Road are snow/ice covered and very slick. To those of you receiving snow, enjoy! I'm envious. Hopefully another big storm will come along soon and go much farther south so us snow fans down this way can have some fun too. What are the conditions like in other areas of the metro? Weird precip in Mpls right now. Hardly anything falling, yet the radars are bright blue. Dry air? Warm air? Snow tally is 3" now in Golden Valley....but unhappy to report that rain is mixing in with the snow....WTF!...its 28° and I have to worry about mix, and just when the best radar returns are over us......go back to snow please. That is what happened down here in Burnsville too, though we got nowhere near 3 inches of snow. The dark radar returns started to develop...and we got mixed precip instead of snow. I know that the event is technically not over, but I am giving kudos to Dr. Novak for last night calling that the 850mb 0 degree line would cut across the metro and thus provide more ice than snow, particularly for the east and south metro. So, Dr. Novak, do you see any true snowstorms for us down here anytime soon? If these trends continue, I'm giving huge marks to Novak and Paul Douglas who seemed to not jump on the "model train" and fluctuate their forecasts a ton the last couple days. They also were the only two I heard who talked about the potential for dry air and warm air aloft. Very helpful and seems to be playing out right before our eyes (even in Minneapolis where we're supposed to be in heavy snow right now). Now the NWS is saying a mix for the south/east metro, which should turn to snow late this afternoon. Since last night they had been calling for a 100% chance of snow. They are a little late to the party. PD and Novak were all over this since at least yesterday. Therefore, they get my kudos as well! Good job guys. Now please bring us a real snowstorm....soon!!! Not over yet boys...batch of snow with significant intensity moving NE into metro next few hours. C'mon snow! This is getting ridiculous. Literally cannot see my car it's buried under so much snow. No mix in the far west metro. The snow is falling faster than you can plow/shovel it away. Heaviest of the day is coming down right now and visibility has deteriorated a lot. Was snow here until 11:00- then changed over to freezing rain. It went to sleet about 12:20, and now it is all snow. And it is coming down hard... Looking at the radar returns- the dry slot is beginning to advance into Minnesota, and the front is slowly approaching the Minnesota border. I know we will be squeezed out eventually, but I hope it isn't the dry slot that does it... although it probably will. whoops, not the front- the edge of the deformation band... sorry. Mix of sleet/snow has changed to steady light snow in Burnsville. Wunderground is forecasting a low 0f -19F for Monday. Talk about the cold blast that is coming. I am NOT looking forward to it. The Euro is only saying -4. My mistake, the Euro is saying -18 Saturday morning, then -18 Wednesday morning. Hooray for washboards! No snow - just rain /drizzle /fog in Rochester. Temp in mid 30's. 850 MB line has been hugging line from Hastings to just east of Mankato all day. 2.3 at 12 pm at the airport. Once again it looks like DD & co. at kstp overdid it as they usually do. sure, it is still snowing, but I doubt we will reach their low end 5 inches. Remember when a few inches of snow came without the media hysteria? Is DD delusional? He says in his aft blurb on kstp.com that the "heaviest amounts today going through the Twin Cities". Huh? I'm looking at 3 inches outside in South Mpls. Is anyone in the NW suburbs? I live in Maple Grove and would love to know what it is like up there now and total snowfall amount, but am at work in Richfield now. Several 6 inch totals in metro now...Blaine, Victoria, Ramsey, Burnsville 2.8 on the lower SE side of the metro. We have a lot of snow in Plymouth/West Metro. Still coming down pretty good and I bet we have at least 6 inches. This is awesome. I think everyone tried their best to predict it well, but even the forecasters were having a hard time putting amounts on it. So many people listen to the same forecast across the metro so one forecast is seen is "their" forecast for over 2 million people. That would be hard. I think Dave Dahl did a nice job of holding his own, at least for the northwest metro. I know that he may have overshot it for the southeast metro, but he did indicate that there would be less there and the line would be really tricky. At least he took a stab at it. I like that. Kudos to Novak--he seems to really put a lot of thought and analysis into it which I really enjoy listening to. All the talk of a bust is just not the case. Maybe I am blinded by the snow falling on my head in Plymouth. Bring it!! I just measured 3 inches here in Burnsville. It's still snowing steadily. It's very beautiful! We didn't get the jackpot here, but at least we have picked up enough to make it look a lot like Christmas! I'm hoping for at least some additional accumulation this evening. Bring it for us too, PWL! Latest snow fall amounts per NWS link --- still incomplete given the very old observations across the far northern metro in some instances. If it doesn't work go to main NWS page and at top click on (Local) Storm Reports. No reports from Apple Valley/Rosemount/etc., but I know 2.5-3" fell in the Rosemount area. Just over 3" here in nrn Burnsville as I measured in 5 different locations in sheltered spots per NWS regs. MSP airport is now officially at 4.1". Based on the numbers thus far -- a forecast of 3-6" across the metro would have been very acceptable and verifiable. There were fringe amounts of 1-2" on very extreme areas to the south and 6-8" on the far west and likely far north. @DDwx I'd say a solid 4 to 4.25 in Highland Park. And agree that 3-6" would appear to be the appropriate forecast. Right around 7" for most of Carver County with temps right around 30 and moderate snow all day. If it had been a little cooler, we'd probably be looking at more like 10 inches. Now that this snow event has come and gone get ready for the arctic blast that isn't far behind. Temps will drop rapidly overnight and should ice stuff up, especially on any roads or sidewalks that haven't been treated yet. Take it easy out there tonight. The next system of interest comes in on Sunday night into Monday. Right now it's not looking like a major system but one thing is very certain on that one. There will be no chance of mixing. In fact snow making conditions with that storm are going to be just about as perfect as they can get for this region. Very cold profile through the atmosphere and little to no wind to break apart the snowflakes will mean it won't take much moisture at all to create accumulating snow across the area. At this point, models are pointing at a tenth to two tenths of an inch of liquid with it, but the NWS is saying ratios could be as high or higher than 30 to 1. Even a tenth of an inch of liquid would push totals into that advisory category. Next weeks cold blast looks worse than the one coming in now especially for those people who have a good snow pack. Bundle up, stay warm, and stay safe. Winter has officially arrived to the area. Good stuff everyone & I agree with your assessment on the next storm system for Sunday Duane. I won't be surprised if a healthy, fluffy (Champaign Powder) snow falls over much of so. MN/WI. Great for skiing. In general, I thought that this storm was forecasted really well by many media outlets & the NWS. Lots of lead time & the amounts were spot on for the most part. I can't imagine that the public is upset with how this storm system unfolded & credit needs to be given to those who stuck their neck out there and predicted several inches of snow and a tough day for travelers even in the MSP metro. Anyway, I love going to this board during snowstorms, not only because of the in depth prognostications, but also because of the fantastic updates during the storm. Overall I have to give two A grades with this storm, and they would go to MPR and the NWS, although I will have to wait until tomorrow night and see the reports from the CoCoRaHS and the COOP observers balanced with trained spotters. I base this on what was posted in the headlines one this thread, even though I know Bill like to concentrate on MSP. PS: I would like to give out one more A (actually A+) grade to someone that comes on here from time to time, and that would be Randy Hill from Chase the Plains. Looks to me like he nailed that 3-6" band across the heart of the metro. I didn't have the time to put together a detailed forecast for the metro with this storm, but many of the long time readers of this blog know that I used to put out a snowfall forecast for the NW,NE,SE and SW metro, those areas were roughly defined from Elk River in the NW to Forrest Lake on the NE and from Hastings on the SE side to roughly Waconia in the SW. I tried to do this to give commuters an idea where the toughest conditions would likely be. I would love just once to see a pro met do that in this market, as I believe to many of them concentrate to much on the I-494/694 corridor. Unfortunately I had to sleep some during the day today because of my 3rd shift but wife said the mix I reported earlier turned back to all snow here in Golden Valley, my final tally was 6.5 inches. I would say good work to most who predicted this storm, but per usual KARE was too conservative and maybe KSTP slightly aggressive.....but for sure the warning was justified. I do have a question(maybe a frustration), but all too often during a winter storm I here about more or less snow either NW of the metro or SE of the metro, exactly where is that?..is it south of 494 and north of 694 ,just seems to me its to vague of broadbrush....and what about in the middle,inside the loop I guess.....I live in Golden Valley which is just west of downtown, I always here what will happen north or south but not much is mentioned about the central metro...just an observation. But I take whatever I can get this snow is awesome, just sucked driving in it this morning after working 11 hours. BTW, I really REALLY like the snow set-up for Sunday. - S/SW winds aloft over an Arctic dome of air. - Large trough kicking into the Plains. - Disturbance rotating around the base of the trough into the Plains. - No concerns for a rain/snow line. The only thing missing may be moisture & that is one big reason why the models are not cranking-out much QPF. However, with this type of cold airmass in place, it won't take much moisture to fluff-up some decent snow totals. For me, this storm is already damn near a slam dunk at this early stage of the game. @bigdaddy: I agree with you 100%. It is frustrating and I think they keep it ambiguous on purpose to then be able to 'spin' as appropriate to match their forecast. I always thought they could divide the area into 4 sectors using maybe I35W as the vertical divider and either 494 or 394 as the horizontal one. Bill, as you sometimes challenge the local mets, why don't try and get more clarifications on what they mean exactly by NW metro vs SE metro? Agree with @bigdaddy's comments as well. As for your wanting to get more clarification about metro regions.... this is why I always try to get a forecast for the airport and use that as the verification. Of course it's never that simple and this is, after all, a large metropolitan area. I wish we were a single dot on the map and that forecasters would provide a specific forecast for that dot. Then the assessment would be so much more straightforward. That said, sometimes you'll find that forecasters do provide snowfall forecasts for individual cities in the metro... i.e., x for Maple Grove, x for the core metro, x for Lakeville, etc. Dr. Novak I remember you mentioning Sunday in your video early this week. I see the NWS is showing 1-2" for Sunday and not predicting a total for Sunday Night. I hope you are wrong -- a pile of fluffy snow when it is that cold would make the Monday morning commute brutal. Roads are bad enough know with the washboard freeways. I know this is a weather blog and not a music blog, but the Sound of Music was just preformed live on NBC and it was quite good for a live deal. I would just like to mention that the Von Trapp Family singers were and are real. I have found a you tube video that was posted a few years back featuring the great grandchildren of the family that was portrayed in the movie. Happy holidays everyone....the great grandchildren of the Von Trapp family. Lots of forecasters are going to be surprised with how much snow falls from this next system, esp. as you travel from MSP on south. I won't be surprised if some portions of MN, WI & IA receive 6"+. This will be a fairly large snow maker since a trough will be associated with it. Damn. I'm totally impressed with the looks of Sunday's storm system. QPF can be deceiving & too many Mets are simply looking at the current QPF model output & downplaying this storm. For me, this storm system is about as sure of a lock as you can get. - Good fetch of S/SW winds from 850mb on up. - 700mb temps at -10 to -15 degrees (good dendrite growth zone, especially just south of MSP). Keep the good news coming, Doc! Keep singing that tune, good doctor......more powder the better. NWS is at it again with their graphics, I don't so much have a problem with their graphic, but my point forecast for Golden Valley for Sunday calls for 1-3" during the day and 1-2" at night, add them together and to me that means a 2-5" snow is likely correct?, but their graphic calls for 1-3".....its like one hand doesnt speak to the other. BTW, Novak love your passion about the weather comes out in your videos and posts...thanks. Completely agree, Bigdaddy. The grid forecasting (weather.gov) is a clear problem. Patrick Hammer (KSTP) just said that Minneapolis should expect 2-4 inches of snow on Sunday, and that more will fall in the southern burbs and points south. Question for the group: If NWS is calling for 2-4 inches on Sunday and 1-3 on Sunday Night, does that mean 3-7 total ibches for the 24-hour period? When was the last time the NWS forecasted 3-6 inches of snow(text underneath their updated graphic this morning)for parts of our CWA without even an headline.....this snow event screams at minimum a winter weather advisory for snow for a good chunk of the CWA. I checked the definition of an advisory is when a low pressure system produces a combination of winter weather either snow,sleet, freezing rain that present a hazard but does not meet warning criteria or if its issued for just snow(snow advisory) its for snow accumulation of 4 inches or more but less then 7 in a 24-hour period....wouldn't it be wise to issue an advisory if their expecting 3-6 inches to fall coupled with the fact them some roads are still iced covered and now were going to add snow over the top....to me thats a hazard! I know I bash the NWS alot on this board, but I go to them alot for my weather and I hold them to a high standard because they are the professionals and most mets follow their lead or at a minimum use them as a guidance. Novak has been all over this system and warning us not to take this lightly even though the qpf wasnt there.....just a few days ago it was a 1-2 snowfall and now it has creeped up to 3-6....way to notice its potential Dr. Novak, can you go work for the NWS? Totally agree with you once again, Big Daddy. And, picky me, I find the MSP weather story graphic to be a touch silly with a few 4-5" "splotches" off the main areas. Looks like paint that dripped where it shouldn't have. It's just way to precise a map.... looks to be a literal representation of a model. Looks like the NWS nailed the forecast well before everyone else! Great job NWS! Short-term models handled it well also.